Version 0.9.10 released; minor tidyups, should no longer require recompiling with each new PA version. Please note that this program can only configure local servers, and requires that a special module module-gsettings is loaded in the sound server. Currently, paprefs is tested on Linux only. It should work on most Linux distributions. 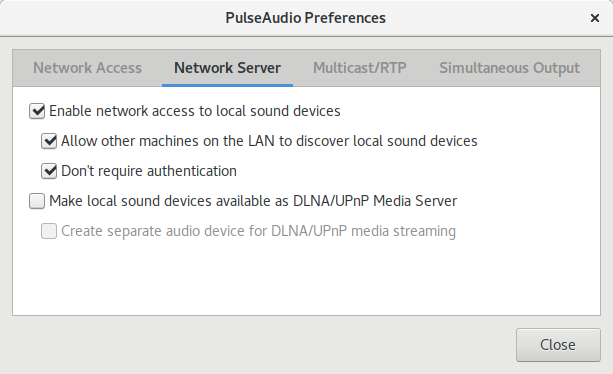 Obviously paprefs requires an installation of PulseAudio (version 12.0 or newer). The module module-gsettings must be loaded in the daemon. As this package is made with the Meson you should run meson build inside the distribution directory for configuring the source tree. After that you should run ninja -C build for compilation and ninja -C build install (as root) for installation of paprefs. If you have patches for paprefs, the primary method for submitting them is by creating a merge request in GitLab. Alternatively, you can send patches to the PulseAudio mailing list (requires subscription).